1. To make Crust: Preheat oven to 375°F. Whisk together flours and salt in bowl. Stir in oil until clumps form. Add 6 to 10 Tbs. cold water, 1 Tbs. at a time, until dough holds together. Shape into ball, cover with damp towel, and set aside. 2. To make Filling: Stir together mustard seeds, curry, ginger, cumin, and red pepper flakes, if using, in bowl; set aside. 3. Cook potatoes in boiling salted water 15 minutes, or until tender. Drain, return to pot, and mash, leaving small chunks. 4. Heat oil in skillet over medium heat. Add onion, carrot, and garlic, and sauté 5 minutes, or until carrot is tender. Move onion mixture to side of pan, and add mustard seed mixture in center. Toast 30 seconds. Stir in peas and broth. Fold onion mixture into potato mixture; stir in agave nectar. Season with salt and pepper, if desired. Spread Filling in 9-inch pie pan. Set aside. 5. Roll out Crust dough to 11-inch circle on floured work surface. Cover Filling with dough, pressing down to make sure no air pockets remain. Trim away excess dough, and crimp edges with fingers. Cut X in center to vent steam; brush with soymilk just before baking. Place pie on baking sheet, and bake 40 to 50 minutes, or until crust is golden. Let stand 5 minutes before serving. The photo above was taken by a recent retreat attendee. 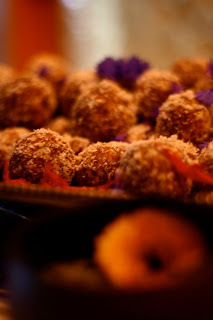 Feel free to browse more photos of some of the colorful dishes from this retreat in her gallery. For the cake, cream together the butter and sugar until light and fluffy and then mix in the eggs. Blend the yogurt with the buttermilk. Sift together the dry ingredients and add them alternately with the yogurt mixture into the egg mixture. Stir in the lemon rind and walnuts. Pour the batter into a buttered 9x13-inch baking pan and bake for 30 to 40 minutes, until a toothpick inserted in the center comes out mostly clean. The cake should still be moist. Meanwhile, make the glaze by simmering together all the ingredients, covered, for about 15 minutes. Remove the cinnamon stick. When the cake is done, remove it from the oven, turn the oven off, pour the glaze over the hot cake, and return it to the oven for about 10 minutes. Cut the cake into squares and serve it warm or cool with a scoop of vanilla ice cream. Use as marinade for steamed broccoli or green beans or cooked cubed beets. Preheat oven to 500°. Scrub the potatoes and cut them into strips. Place them in a large bowl and sprinkle with the oil and seasonings. Toss to mix. Spread in a single layer on a baking sheet or pan and bake, uncovered, until tender, about 25 min. Whisk until mixed. Pour over cut roots in large bowl & stir to coat. Spread on baking pans, cook ~ 1h. At 400°, stirring every 20 min. to prevent sticking. Melt butter, onion, garlic. Add flowers. When soft, add broth and bring to boil. Reduce heat and simmer 10 min. Blend, add milk and seasonings. Cook split peas and water 1½ to 1¾ hours on medium until peas totally dissolve into the liquid. Then add the onions, herbs. veg. Cook medium-to-low heat 20-25 min. In a medium soup pot, sauté the onions and garlic in the oil, stirring frequently, until the onions begin to soften. Add the tomatoes and cook until the onions are golden and the tomatoes soft. Stir in the chili powder, flour, salt, and pepper and mix well to coat the vegetables evenly. Pour in the stock slowly while whisking diligently to completely dissolve the flour. Coarsely blend the soup in a blender or food processor and return it to the pot. Bring the soup to a boil, then reduce the heat and simmer it gently for 20 to 30 minutes. While the soup simmers, prepare the dumplings. Cream the butter with the egg yolks until smooth. 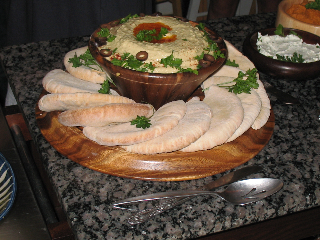 Place the couscous in a small bowl. Pour the boiling water over the couscous, cover the bowl with a plate or pot lid, and allow it to steam for 5 minutes. Add the steamed couscous and the flour, salt, dill, and milk or stock to the butter mixture and blend well. In a separated bowl, beat the egg whites until stiff and then fold them into the couscous mixture. Drop the dumpling batter into the simmering soup by rounded tablespoons and cook, covered, for about 15 minutes. The dumplings will rise to the top; scoop one out and test it to be sure it is thoroughly cooked. Soak 3 hours. Drain, cover with water (2 inches) in pot. Bring to boil and simmer on low, uncovered until almost tender, about 35 min. Drain and reserve liquid. In large frying pan over low heat, warm olive oil. Sauté onions until soft, about 10 min. Add ginger, garlic and spices stirring for 2 min. Add tomatoes, cover and cook 2 more min. Uncover and on medium heat, add 1 Tbsp of yogurt at a time stirring very well each time. Add peas, ½ cup of the reserve cooking liquid, salt to taste, and cayenne. Cover and simmer on medium for 15 min. Uncover and cook stirring occasionally, until liquid very thick, 3-5 min. Garnish with cilantro and serve as an East Indian-inspired main course with basmati rice. For the tofu layer, sauté the chopped onions in the oil with the thyme, coriander, and black pepper until the onions are translucent. Stir in the chopped walnuts and shredded tofu. When heated through, stir in lemon juice and soy sauce. Remove from the heat. To make the mashed potatoes, place the cubed potatoes in a saucepan and cover with lightly salted water. Bring to a boil, and then simmer until the potatoes are soft. Drain, saving the hot potato water to use in the gravy. Mash the potatoes with the butter and milk. Salt to taste. For the gravy, heat the oil in a skillet. Stir in the mushrooms, soy sauce, and black pepper. Sauté, stirring occasionally, until the mushrooms are tender. Add 1½ cups of the potato water and bring to a boil. Slowly stir in the cornstarch mixture and cook at a low boil, continuing to stir, until the gravy is clear and thick. Oil a 9-inch square casserole dish or use a 10-inch round cast-iron skillet. Layer the tofu mixture, then the mushroom gravy, and then the mashed potatoes. Dot the top with butter or margarine. Bake at 400° for 15 to 20 minutes until the top becomes golden. Dissolve the yeast in the warm water in a large mixing bowl. In a saucepan, heat the molasses, orange peel, caraway, and salt to boiling, stirring constantly. Remove it from the heat, stir in buttermilk, and allow it to cool for several min., until lukewarm. Add the molasses mixture to the yeast. Gradually add the rye flour and beat the batter 200 strokes. Stir in 2½ cups of the wheat flour, until the batter is stiff. Cover with a cloth and allow to rest for 15 min. Knead the dough on a floured surface for about 5 min. The dough will be sticky, so flour your hands well. Add at least ½ cup of the remaining wheat flour and more as necessary as you knead the bread, until the dough is moist but workable. Place the dough in an oiled bowl, cover it with a cloth, and let it rise in a warm place for an hour. Punch down the dough, form it into two round loaves, and score an x in the center of each loaf with a sharp knife. Place the loaves on an oiled baking pan, about 4 inches apart, and let them rise for 45 min. In a small pot, bring the water and molasses for the glaze to a boil and then simmer for 5 min. Allow to cool 10 min. When the loaves have risen, preheat the oven to 350°. Brush the tops and sides with half of the glaze. Bake the bread for about 50 min. Glaze it with the remaining glaze as soon as you remove it from the oven. This bread is especially nice with sharp cheddar and slices of fresh tomato. Note: There is a dark rye flour sometimes referred to as “pumpernickel rye” that is especially nice for this type of bread. To create a warm, draft-free environment where the bread can rise, boil several pots of water and place them in your oven with the bowl of dough. The oven is insulated and will retain the warmth produced by the pots of hot water. For the crust, mix the yeast and water in a large bowl and set aside for about 5 minutes until dissolved. Mix in the salt and olive oil. Stir in 2 cups of flour and beat well. Gradually add enough of the additional 1½ cups of flour to form a soft dough. When the dough pulls away from the sides of the bowls, turn it onto a lightly floured board. Knead it for about 10 minutes, until smooth and elastic. Wash out the bowl and oil it with 1 tablespoon of olive oil. Place the dough in the bowl, turn it over to coat with oil, and cover the bowl with a damp cloth. Let the dough rise in a warm place until doubled in bulk, about 1½ hours or overnight in the refrigerator. Just before you’re ready to use the dough, preheat the oven to 400°. Now make the topping by sautéing the sliced onions in the olive oil until translucent and beginning to brown, about 15 minutes. Add the black pepper and thyme. Sauté for 5 more minutes. Punch down the dough and knead it briefly in a bowl. Oil a pizza pan or baking sheet with the remaining tablespoon olive oil. Press and stretch the dough to cover the pan and form a ridge around the edge. Sprinkle the grated cheeses over the dough. Top with the sautéed onions and the olives. Bake for 30 to 40 minutes, until the crust in the center is firm and springy. Serve immediately with a green salad and Roasted or Grilled Vegetables or with a soup. Preheat the oven to 400°F. Grease muffin tin. Mix together the dry ingredients. Beat together the egg and oil. Mix all. Bake 20 to 30 min. Add 1 teaspoon cinnamon to dry ing. and increase sugar to ½ cup. Add 1 cup of the fruits to the batter at last minute. Blueberry are good with ½ teaspoon lemon zest and cranberry with ½ cup chopped nuts and/or 1 tablespoon minced orange zest. Add 1 teaspoon cinnamon, ½ teaspoon each allspice and ginger, and 1 pinch cloves and mace or nutmeg. Use 1 cup of whole wheat flour in place of 1 cup of white flour. Add ½ cup raisins or currants if you like. Good with half bran or whole wheat flour. Add ½ cup roughly chopped walnuts, pecans, or cashews. Substitute 1 cup mashed very ripe banana for ¾ cup of the milk. Use honey or maple syrup in place of sugar. Substitute 1 cup bran for 1 cup of flour. Use 2 eggs and honey, molasses, or maple syrup. Add ½ cup raisins if you like. about 5 to 10 min. Add the green onions and seasonal vegetables. Simmer for 5 more minutes or until those vegetables are crisp-tender. In a small bowl, slowly add 1 cup of the soup broth to the miso and whisk until there are no lumps left. Add the miso and tofu to the soup. Turn off the heat and cover the pot. Let the soup steep for 3 to 4 min. Combine all the ingredients. For the best flavour refrigerate for at least an hour before serving. Serve chilled. is absorbed (be careful not to burn). minutes for the flavour to develop. Preheat oven to 350 F. Grease a cookie sheet and set aside. Sift the flour twice to give more lightness to the cookies. Stir in lavender, baking powder, flax seed and orange zest. In separate bowl, beat butter with sugar until pale. Beat in egg and vanilla. Slowly beat in dry ingredients. Place batter, one Tbsp at a time, onto cookie sheet. Sprinkle the tops with almond slices, then bake for 15 to 20 minutes or until golden. *Any herb or flower (roses, sage, basil, tea mix, etc.) can replace the lavender. While the beans are nearly finished, in separate pot, steam the hard vegetables like potatoes, artichokes, carrots and eggplant for 10-15 min. Then add the rest of the veg., and cook another 7-10 min. until tender but still slightly crunchy. Then add all the drained veg. to the beans along with all the herbs and spices. (save the steaming water for stock) Simmer everything together on low to medium heat for 20-30 min. until the flavours mingle. Fill a large saucepan with just enough water to cover the artichokes once they are added. Bring to a boil. Add the artichokes and cook, uncovered, over high heat until tender but still firm, about 15 min. Drain well and let cool. Peel and cut into ½ inch slices. Set aside. In a saucepan over medium heat, melt the butter. Add the onion, thyme, and sage and sauté for 2 min. Add the flour and cook, stirring, for 1 min. Slowly add 1 cup of the warm milk, stirring constantly. As the sauce begins to thicken, slowly stir in the remaining 1 cup milk. Continue to stir until thickened, 1-2 min. Season to taste with salt and pepper. Mix the sauce with the artichokes and transfer to a 1½-qt (1.5-l) baking dish. Sprinkle with the cheese and dust with paprika. Place the baking dish on a baking sheet. Bake until the sauce bubbles and the cheese is golden, 10-15 min. Soak the kombu in 4 cups of cold water for 8 hours or more. Remove the kombu and reserve for another use. The stock can be used at this point to make a light miso soup. Add the ginger, soy sauce, sake or sherry to the pot. Bring to a boil. Lower the heat and simmer for 10 min. Add the mirin. Taste broth and adjust the seasonings. For an earthy-tasting broth, add 1 or 2 dried shiitake mushrooms per cup of water. The kombu that is soaked for the broth can be saved, cut into strips, and stir-fried with tofu or vegetables, or added back into a soup at the end of cooking. In blender, whirl the garlic, onion, carrot, and ginger for about 30 seconds. Add the rest of the ing., except the salt and pepper, and process until thickened. Stir in salt and pepper to taste. Will keep for four to five days refrigerated in tightly sealed jar. Cook and reserve the cooking water and a few chickpeas for garnish. In food processor, combine the cooked chickpeas, juice of 3 lemons, tahini, 2 tablespoons of the cooking liquid, the 3 tablespoons olive oil, garlic, cumin and ¾ teaspoon salt. Add a little more cooking liquid if needed. Taste and add more lemon juice and salt as needed. Garnish! In a large saucepan, heat oil. Add onion, garlic, gingerroot and curry powder. Cook 5 minutes, add rice. Stir-fry 2 minutes or until transparent. Add stock. Bring to a boil, reduce heat, cover and simmer 10 minutes. Rinse spinach, discard tough stems and dry well. Cut into thin shreds. Add to pan and cook 5 minutes longer. Into a small bowl, place coconut. Stir in boiling water, stirring until melted. Stir into pan with cilantro. Heat through 2 to 3 minutes, without boiling. Taste and adjust seasoning. Serve hot. In a medium soup pot, on medium heat, sauté the leeks and onions in the olive oil and butter until the onions are translucent, about 10 minutes. Stir in the zucchini, salt, and garlic. Sauté for 10 more minutes, until the zucchini is tender. Add the tarragon, fennel, and black pepper. Cook for a couple of minutes. Remove half of the vegetables and set aside. Sprinkle the flour into the soup pot, stirring, until the vegetables are well coated. Whisk in the stock. Heat, stirring frequently, until the soup begins to thicken. Remove it from the heat. When the soup has cooled a little, purée it in a blender or food processor and return it to the pot. Add the reserved vegetables and heat the soup to simmering. Stir in the milk. Heat very carefully, using a flame tamer if you have one. Take care not to let the soup boil. Grease a 9-inch square or round pan. Sift the dry ingredients together into a large bowl. Combine the syrup, soymilk, lemon juice, ¾ cup of warm water, and warm oil. Stir into the dry mixture and beat until smooth. Pour into the prepared pan and bake for 25 minutes. In a large bowl, beat together the eggs, milk, oil, salt, and brown sugar (if desired) until well blended. Sift in the baking powder and whisk until foamy. Quickly mix in the cornmeal and flour. Beat until the batter is smooth. Pour into an oiled 9-inch square or 10-inch round baking pan. Bake for 20 to 25 minutes, or until a knife inserted in the center comes out clean. In a food processor, pulse together the flour, coconut, sugar, thyme, and ¼ tsp salt. Cut the butter into cubes, and add to the flour mixture; pulse until mixture is crumbly, about 20 seconds. Gradually add the water in a slow, steady stream, until mixture forms a rough ball. Turn the dough out onto a sheet of plastic wrap, and shape into a thick disk. Wrap tightly, and refrigerate for 1 hour. Preheat oven to 425°. On a lightly floured surface, roll dough out to ⅛-inch thickness. 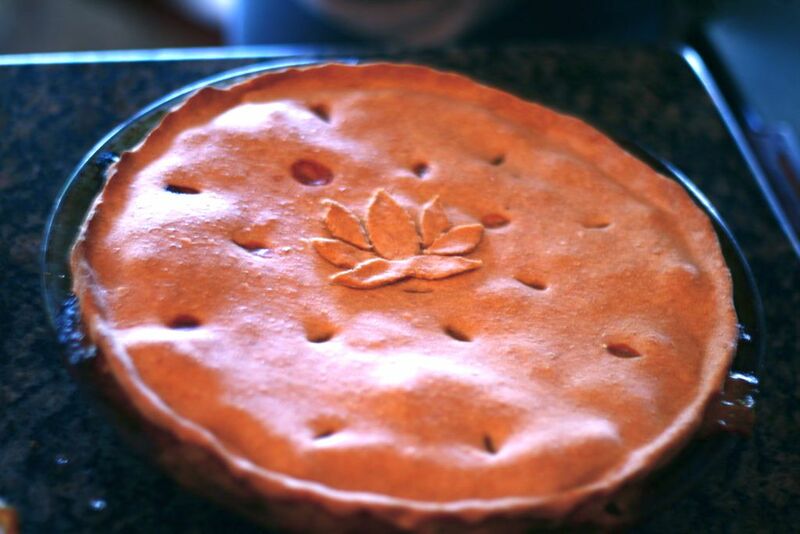 Place in a 9-inch fluted tart pan, pressing up the sides. Line dough with parchment paper; fill with pie weights, and bake for 8 to 10 min. Remove pie weights and parchment, and bake an additional 4 minutes; set aside to cool. In a large bowl, combine the remaining ½ tsp salt, sugar, cornstarch, ginger, cinnamon, cloves, pumpkin puree, and eggs. Gradually stir in the milk and pour into prepared crust. Bake for 10 min. Reduce heat to 350°, and continue baking for 15-20 min., or until the center of the tart does not move when pan is tilted. Cool on a wire rack. Garnish with fresh thyme. Combine ing. in bowl. Mix in water. Knead well (consistency of ear lobe, slightly sticky). Allow dough to rest one hour, or overnight. Shape into small balls. Roll into flat round (thinner = crispier). Heat a cast iron skillet. Oil each chapattis on both sides (optional) but do not oil skillet. Cook each side for a minute, until lightly brown. Heat the oil over medium heat in a heavy-bottomed skillet or Dutch oven that has a tight-fitting lid. Add the carrot and onion and sauté 5 minutes. Add the kasha, garlic, and caraway and sauté 3 minutes. Stir in the stock, salt, and pepper. Bring to a simmer, cover the pan tightly, reduce the heat to low, and cook 20 minutes. Turn off the heat and allow to stand 10 minutes before removing the lid. Transfer the kasha to a bowl or platter and toss with the paprika, breaking up large clumps as you do. Serve hot. In a heavy-bottomed, 2-quart pot or saucepan with a cover, combine the rice plus 1½ cups cold water. Turn the heat to high, bring the water to a boil, and stir the rice just once. Lower the heat to low, cover the pot, and steam the rice 20 to 22 minutes, until it is tender and the excess liquid has been absorbed. Or prepare the rice according to the package instructions. Cook until the rice is tender but slightly firm, and remove from the heat. its ready to work with. While the rice is cooling, prepare the filling by steaming the tempeh. Allow the tempeh to cool for 10 minutes, chop into small cubes, and place in a medium-size bowl. Add the mayonnaise and chile-sesame oil and mash until chunky; taste and add more chile-sesame oil if desired. 1. Place the nori sheet on the bamboo mat. With wet hands, take a snowball-shaped handful of rice, about a cup's worth. Gently pat onto the bottom two-thirds or so of your nori sheet. The layer of rice should be a ¼ inch thick at the most and least. 2. Place a small amount of the filling across the center of your rice. Lay or spread them horizontally to each side of the nori to create a straight line of filling-the less filling, the easier the sushi will be to roll. Aim for about 1½ tablespoons of Spicy tempeh, three strips of avocado, and some scallion strips. You'll figure out. 3.Using the mat, gently roll up that sushi starting from the rice-topped end; try to keep your grip relatively tight, for a firm roll. When you've reached the seaweed-only end, pat gently with a little bit of vinegar water to seal the roll. 4. Slice your roll into 1-inch pieces with a sharp, serrated knife. That's it! Make a hundred of'em. Pear and Tempeh Roll: Substitute ½ recipe (about 1½ cups) of Creamy Asian Pear and Tempeh Salad for the spicy tempeh filling. Elephant Roll: Stuff the sushi rolls with 2 tablespoons of roasted peanuts and a few slices of ripe avocado per roll. "Yamroom" Roll: For each roll, fill with tablespoons of mashed sweet potato, 1 to 2 dried or fresh shiitake mushrooms simmered in ½ cup water, 2 tablespoons of soy sauce and a dash of mirin. Sprinkle the filling with sesame seeds before rolling. Spinach Sesame: Lightly steam ½ pound of well-washed, fresh spinach, squeeze to remove and excess water, and chop finely. Toss with 1 teaspoon of sesame seeds, and a dash of rice vinegar. Fill and roll as directed for the Spicy Tempeh Nori Rolls. Maybe you've been rolling your own for a while, or you just need to look like a master sushi chef right now! Then inside-out rolled nori rolls will get you the attention you so deserve, and with way less stress than you might expect. 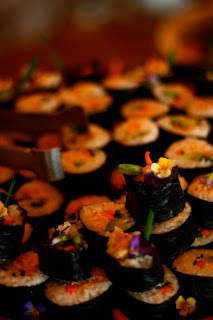 Simply prepare your nori roll as directed, spreading the seasoned rice onto about two thirds of the toasted nori sheet. Place a sheet of plastic wrap on top, gently slid your hand underneath the bamboo mat and rest your other hand on top of the plastic wrap. Then in one quick motion... flip everything upside down. Remove the bamboo mat from underneath and place on your countertop. Place the nori and rice-plastic wrap side down-on the mat. Place fillings as usual on the edge without the rice underneath it. Then , carefully roll everything up, using the bamboo mat to firmly push everything together and being careful to peel away the plastic wrap as you go. For best results, roll your spiffy inside-out rolls in fun things like toasted sesame seeds, black sesame seeds, toasted nori flakes or Japanese ground up red pepper. Terry recommends you just pour whatever it is you're rolling your sushi in into a shallow large dish and just drop your inside-out rolls into it as you work. Makes four rolls and takes about 40 minutes. Mince garlic, slice other vegetables in bite-sized pieces. Sauté garlic & onions & caraway seeds until onions are translucent. Then add (mushrooms), cabbage, apples—add the next vegetable when the one you just added has warmed. Add seasoning and cook until cabbage is just tender. Trim off the tough outer leaves of the Brussels sprouts. Cut the carrots into 1-inch-thick slices and the leeks into ½-inch pieces Steam the vegetables until tender, for 10 to 12 minutes. Drain. Meanwhile, melt the butter in a heavy saucepan. Stir in the remaining ingredients. Toss well with the hot, drained vegetables and serve immediately. On a lightly floured surface, roll out dough. Use to line a deep 9-inch fluted tart pan. Prick bottom and refrigerate 20 minutes. Preheat oven to 400°F. Quarter and seed bell peppers. Broil 4 to 5 minutes or until lightly charred. Let cool slightly, then peel and thinly slice flesh. Steam broccoli 3 min. Line the tart shell with foil and pie weights. Bake blind 10 min. Remove weights and foil and bake 10-12 min. longer until pastry is crisp and golden. Arrange bell peppers, broccoli and olives over bottom. Beat remaining ing. together until smooth. Pour over veg. Bake 35 min. or until set in center. Cool and serve warm or cold. Preheat oven to 350F. Carefully rinse beets to remove any dirt. Trim stems to about 2 inches. Dry well.In a small roasting pan, place beets. Cover loosely with foil and bake 2-¼ hours or until skins wrinkle to the touch and beets are tender. In a saucepan, thoroughly combine cornstarch, sugar and cocoa. Add milk and stir until very smooth. Cook on medium heat, stirring constantly until the pudding comes to a boil. Then lower the heat and gently simmer, stirring continuously for 3 or 4 min. Stir in vanilla. Pour hot pudding into a decorative serving bowl or 4 individual custard cups. Serve warm or chill for about 2 hours, until cold and set. Garnish with mint leaves. Chop cashews rather fine (the blender chops them too fine). Remove cardamom from pods and grind. Combine cashews and cardamom in a bowl with dates and orange peel. Knead mixture with fingertips until uniforms, then roll into 1-inch balls and coat them with coconut. Trancher les légumes minces et placer dans un plat allant au four en alternant les tranches de chaque légumes et en finisant avec les patates. Couvrir d’huile d’olive et cuire à 400°F jusqu’à tendreté désirée. Saupoudré de basilic frais, de jus de citron, de sel et de poivre. Sift the dry ingredients into a large bowl. Add the cheese, zucchini, parsley, scallions, and dill and toss lightly to mix. In another bowl, beat the eggs and then whisk in the buttermilk and melted butter. Add the wet ingredients to the flour-zucchini mixture and stir just enough to blend. Spoon the batter into buttered muffin tins, filling them about ¾ full. Bake for about 30 to 35 minutes or until golden. Wash and trim squash. Slice, reserving 8 very thin slices for garnish. In a large saucepan, melt butter; gently sauté onion and lemon. Sprinkle with flour and cook slowly, stirring, until flour is absorbed. Add broth gradually, then sliced squash, salt and pepper. Simmer for one hour. Puree soup in blender. Add nutmeg and milk. Do not allow to boil. Garnish. Mix well until liquid consistency. Pour into a baking dish of about 6 x 10 oiled. Bake at 350°F about 50 to 60 minutes. Serve warm or cool and keep in the fridge. Serve on bread or crackers. Kasha is the Russian name for buckwheat, which is not a member of the wheat family as might be expected, but a relative of the rhubarb plant! In a small bowl, stir the kasha into the beaten egg and set aside. Meanwhile, heat the stock or water to a simmer. In a large, heavy skillet, lightly sauté the onions and mushrooms, if used, in the butter until the onions are lightly browned. Add the egg coated Kasha and, on high heat, stir and chop the kasha with a fork or wooden spoon for three minutes, until the egg has dried and the kasha kernels are mostly separated. Quickly and carefully add the hot liquid, leaning away from the skillet to avoid being splattered. Stir in the salt and pepper. Cover with a tightly fitting lid, reduce the heat to low, and steam the kasha for ten to fifteen minutes. Check to see if all the liquid has been absorbed. If not, steam for a few more minutes more. Meanwhile, cook the noodles on boiling salted water until tender; drain and set aside. When the kasha is done, add the drained noodles to the skillet and toss, adding more butter, salt, and pepper to taste. Serve piping hot. Serve Kasha Varnishkes with Gingered Beets and fresh applesauce for a complete winter supper. wet ingredients in medium bowl. Add dry ingredients to wet ones. Mix quickly and spoon into 6 muffin cups (oil with a mix of oil and lecithin). Bake at 425 for about 20 minutes. For Spice Apple Muffins, omit the lemon zest and replace the blueberries by 1 apple. Add to the dry mix: 1/2 tsp allspice, 1/2 tsp ginger and a pinch of clove and mace or nutmeg. For Cranberry Nut Muffins, replace the lemon zest by orange zest and the blueberries by 1/2 cup of cranberries and 1/4 cup of nuts and adding 1/4 cup extra of sugar. Blend cilantro and broth. Melt butter, mix with flour then add to the blended mixture until thick. Add spices, milk and some lemon juice. Amener les lentilles, les légumes et l’eau à ébullition et laisser mijoter 1 heure à feu doux ou jusqu’à ce que les lentilles soient très tendres. Ajouter le reste des ingrédients et faire mijoter un autre 15/20 minutes en brassant occasionnellement. Cette soupe se conserve une semaine au réfrigérateur. Faites-en une bonne quantité et congelez-la! Some photos from a past retreat... more to follow... Enjoy. 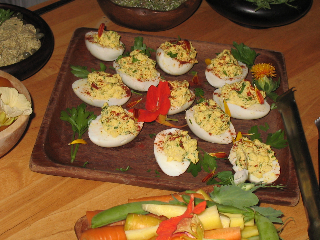 This is a recipe that we use in our Indian themed meals during retreats. 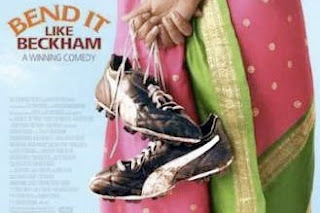 The recipe was adapted from the DVD Bend It Like Beckham. It was featured as an extra on the disc where the filmmaker's mother prepared the dish and shared her traditional recipe. Heat vegetable oil in a large saucepan. Add the chopped onion and one tablespoon of cumin seeds to the oil. Stir together and cook until onions become creamy, golden, and translucent. Add chopped coriander stalks, two teaspoons of turmeric, and one teaspoon of salt. Stir tomatoes into onion mixture. Add ginger and garlic; mix thoroughly. Add potatoes and cauliflower to the sauce plus a few tablespoons of water (ensuring that the mixture doesn't stick to the saucepan). Ensure that the potatoes and cauliflower are coated with the curry sauce. Cover and allow to simmer for twenty minutes (or until potatoes are cooked). Add two teaspoons of Garam Masala and stir. Sprinkle chopped coriander leaves on top of the curry. Turn off the heat, cover, and leave for as long as possible before serving. Pan-fry onion and garlic in oil until translucent, then add cubed or sliced tempeh, soy sauce, and water. Simmer until liquid is evaporated. Serve on rice, pasta, or salad. Mix the topping. Pack apples. Drizzle barley malt on apples. Pack topping about ½ inch thick. Bake until it bubbles. Preheat the oven to 350 F. Oil a 10-cup Bundt pan or 12 small ones. To make the cake, sift the 2½ cups flour, the baking powder, and salt together. Using a handheld mixer with beaters or a stand mixer with the paddle attachment, cream the butter, sugar, and lemon zest together on medium-high speed for 3 to 5 minutes, until light and fluffy. Add the eggs one at a time, scraping down the sides of the bowl after each addition, then stir in the lemon oil. Stir in the flour mixture in three additions alternating with the buttermilk in two additions, beginning and ending with the flour mixture and scraping down the sides of the bowl occasionally. The batter will be very thick. Toss the rhubarb with the 2 Tbsp flour and fold half the rhubarb into the batter. Pour the batter into the prepared pan and sprinkle the remaining rhubarb on top. Bake for 30 minutes, then rotate the pan and cook for an additional 30 minutes, or until the top of the cake is firm and the center springs back when lightly touched. Cool the cake in its pan on a wire rack for 30 minutes before inverting and removing the pan. To make the lemon glaze, whisk the powdered sugar, lemon juice, and butter together. The mixture should be thick. If it is not, whisk in another Tbsp or two of the sugar. Spread the glaze over the cake as soon as you remove the cake from the pan. Storage: Covered with a cake cover, the cake will keep at room temperature for 3 to 4 days. In blender, mix on high speed all ingredients except oil. Then, with blender on medium speed, slowly add oil. More water can be added if a thinner consistency is desired.